Peppermint liqueur and I have a bit of a… sordid past if you will. It was definitely a favorite of mine when I first discovered it among the contents of a family friend’s liquor cabinet. But now with time in-between us, a lot of time, I can revisit this old favorite of mine and class it up a bit for my current tastes. And that means making my own. So, I definitely am a little obsessed with holiday DIY projects. In my mind, friends and family look forward to this time of year as I bestow copious amount of boozy concoctions on them. This year is no exception. See, they’re going to love it because it looks like you spent a great deal of time researching and making this spectacular liqueur. You win the holidays. And no one will need to know it took you less than 15 minutes to make a big batch and divvy it up among bottles for gifts. It will probably take you longer to drive to Target, park, pick out some cute holiday cards, stand in line, drive home, and write a special note to attach to the bottles. And don’t forget some ribbon! If you’re short on time, but want to give something special for the holidays, this is IT. Today I partnered with Everclear to help you folks win holiday gift giving with this super easy, Shimmery Peppermint Liqueur. 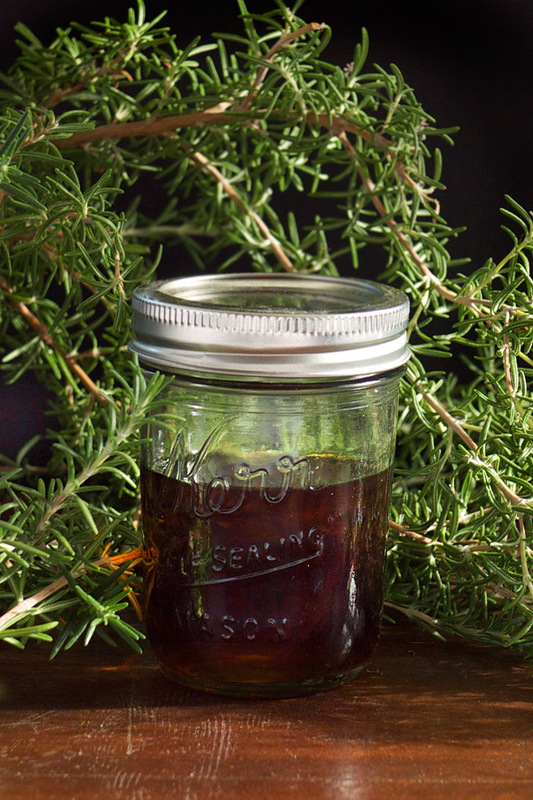 You all know that I love using Everclear for my infusions, tinctures and bitters, and today it’s the base for this liqueur. Starting with a higher proof means I can adjust the ABV as I see fit. Maybe I want to go a little higher on one batch, a little lower on the next; I get to decide. Everclear also has a neutral taste so just the delicious, invigorating peppermint taste comes through, not notes of grass or potatoes, or, I dunno, tree bark. Once you make this, you’ll definitely want to store it in some clear, air-tight bottles because NO ONE can resist holding it up to some light and swirling it around. NO ONE. Maybe stick some fresh greens and some ribbon on the outside and your gift is done. Note: make sure you buy NON-TOXIC, EDIBLE luster dust. There are some luster dust products that are for decorative use only and not intended for consumption. Don’t buy those. Read the label. Also, do not put your head directly over the warm syrup when adding the peppermint extract. Any steam will send the extract right into your eyes! And it might sting! Now, let’s make some liqueur! In a medium saucepan over medium-high heat, stir together the sugar and water until sugar dissolves. Remove from heat and add in peppermint extract and Everclear. Stir everything to combine. 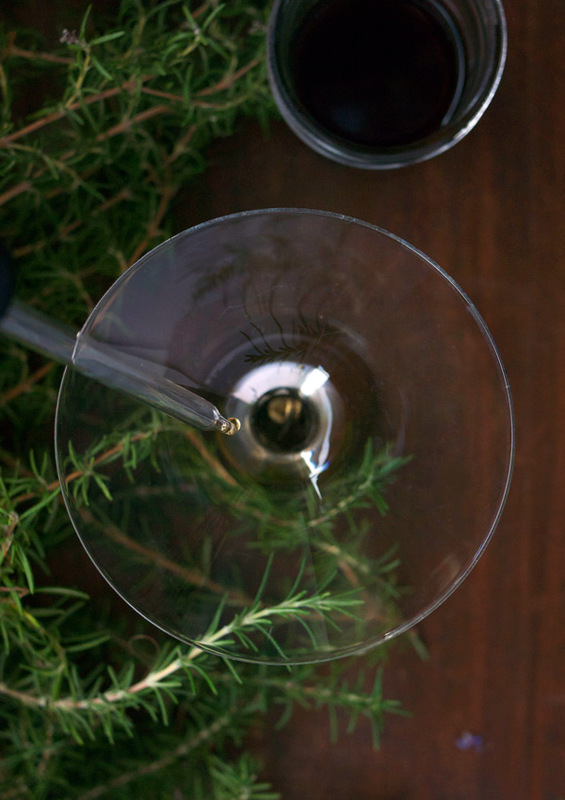 To create shimmery effect, sprinkle luster dust in the bottom of the container you’ll store the liqueur in. Pour in the peppermint liqueur. Seal, and shake well to combine. Luster dust will settle to the bottom after awhile so shake well before serving. The older I get, the more the traditions and holidays leading up to Easter get blurry. When I was a kid at parochial school, there was Lent, there was a day where we all got palms and some day where we all walked around with ash on our foreheads (this could have been the same day, I can’t remember now), and for what seemed like an eternity we were not allowed to eat meat on Fridays. I vaguely remember having a carton the size of an individual milk serving where we collected change to give to… someone during this time too but mainly went barren until my mom made us empty out our piggy banks to fill it. But then after all this we were rewarded with waking up one morning able to stuff our faces with chocolate before we even had our daily OJ. Score. I don’t remember the exact time in my life when I learned about Mardi Gras, and I use the term “learned” loosely as I still don’t know all the intricacies surrounding this event, but I was intrigued by this parallel party during this season. Again, the ideas and customs are still a bit fuzzy, there’s a parade, beads, lots of drunk college kids, general overindulgence, and King Cake, where you bake a baby into dessert. Out of all these ideas I’ve tended to gravitate towards the cake because… cake; I just don’t focus too much on the baked baby part of it. This month I partnered with Everclear again to develop a cocktail to celebrate with during Mardi Gras, and that made you think of the flavors of New Orleans and that special infant-hidden-in-a-cake cake. This cocktail is more on the sweeter side, it’s indulgent and a good fit for getting in all that excess before you need to cool off for 40 days (or if you don’t do that, hell, you can still party it up all the way through April drink in hand). The passion fruit and lemon juice started as a riff on a Hurricane and then I added in some almond and berry flavors to represent the cake. The Everclear is my neutral backbone for all the flavors and to give it that boozy kick. And if you’re wondering why the green sanding sugar garnish, that and the purplish drink color also represent the green and purple colors of the King Cake. The sugar is optional, but for this party drink I’m pulling out the flourishes. Except for the baby. I’m leave that addition up to you. First, rim a chilled cocktail coupe with green sanding sugar. Then, in a shaker 2/3 filled with ice, shake for 20 seconds. 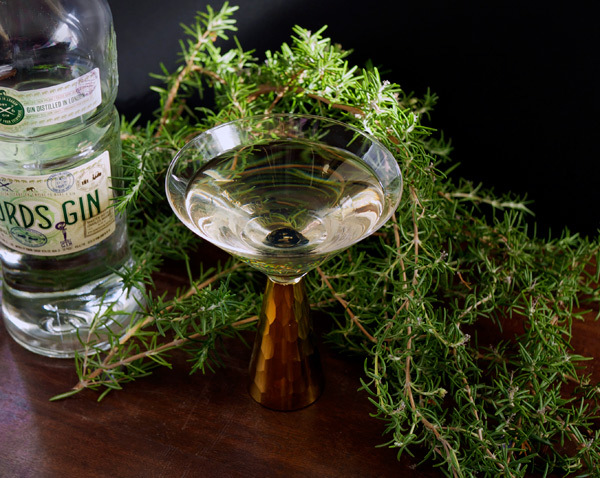 Strain into the chilled and garnished cocktail coupe. Enjoy! If this recipe looks familiar to you, you may have seen it next to a bottle of Everclear at your local liquor store (or package store! Who calls it that outside of New England?). Caramel Apple Jellies the cocktail you eat! Ok everyone! Are you ready to start talking holiday entertaining? No? Wasn’t it just August? I’d say it feels that way except for this mountain of apples on my counter and the JUG of apple cider I decided was an economic buy this week. Why don’t they ever sell cider in small containers? However, I’m actually happy to have it around because it really is time to start thinking about holiday parties and batching drinks and well, making things with apple cider. Are you the person tasked every year with bringing the drinks to the party? I am. Regardless of whether I am going to a friend’s house or a relatives house, if I don’t show up with some sort of boozy concoction it’s as if I killed Rudolph and used him for the Thanksgiving Turkey. I mean, I get a lot of shade thrown at me and very raised eyebrows. This year for the earlier Fall parties I have a new trick up my sleeve. Instead of the vast caldrons of spiked apple cider I usually inflict upon people, I’ve downsized the drink. Actually, I made the drink edible and it fits in the palm of your hand. Neat, huh? Edible cocktails have appeared a few times on this site and I stand by them as completely appropriate party “drinks”. To get in the festive Fall spirit we’re using up some of those apples you all probably have piled on your counter and, of course, that jug of apple cider. The booze portion is courtesy of Everclear. As part of their Make It Your Own campaign we’re elevating the edible cocktail into a fantastic fusion of apples, cinnamon, and rich caramel sauce. OH yeah. Caramel sauce. I made a small batch of my own caramel sauce but store bought is completely acceptable. I’ve linked to a favorite recipe of mine below if you feel up to making it from scratch (plus, if you do, it takes less than 20 minutes and tastes SO DANG GOOD). The recipe for making these jellies easily doubles or triples depending on the size of your crowd. You can make it your own by customizing how you serve these. I hollowed out apple halves and sliced those after the jellies set (cute, right? ), but you also have the option of using a mold and then popping them out to serve on their own. So at your next pumpkin carving/Fall party/barn raising this season, show up with a tray of these Caramel Apple Jellies instead of the usual spiked cider and you will be cheered. Believe me, no one is going to miss it when they’re scarfing down these goodies. In a large mixing glass with a spout, pour in apple cider. Sprinkle gelatine over the liquid and let it sit for 5 minutes to bloom. Then pour in near boiling water and whisk to combine. Add Everclear, cinnamon and salted caramel sauce and stir. Pour into cored apple halves or molds and let sit refrigerated for 6 hours or overnight. To remove jellies from semi-spherical molds, carefully run a small spoon around the edge and slowly invert the mold to pop out the shot. If using square or straight-sided molds, run a butter knife around the edge and slowly invert the mold to pop out the shot. For other shapes or non-flexible molds, dip the bottom of the mold in warm water for 15 seconds, invert mold onto a baking sheet, and gently tap the mold to release the jello shot. To serve from apple halves, slowly slice apple into desired thickness. Caramel Apple Jellies can be refrigerated for up to 3 days in an airtight container. It’s Tuesday, so I bet you’re already thinking about the weekend by this point in the day. So how about a fun DIY project to start planning? That involves doing something with all that winter citrus you have hanging out in your fruit basket? Making bitters might seem like a daunting task, but a lot of it is just sitting around waiting for it to be done already. Kinda like Limoncello (or Tangelocello). And, this recipe yields enough that you can bottle up and give away some as gifts. Those people will think it took you forever, but you don’t have to tell them how easy this is. My recipe is based off of B.T. Parsons’ recipe found in his essential book on bitters, aptly titled “Bitters “. I made his version last year to the letter and enjoyed the results, however, I found that this year I wanted a version less sweet and delicate, and more bitter with richer citrus notes. So that’s what you’re getting here. A couple of tips to help you along the way: First, use a vegetable peeler to zest the citrus. Using a light hand while peeling will help keep the pith on the fruit and not on the zest (YOU want to control your bitterness in the recipe, not the fruit). Second, invest in some cheesecloth . A small amount of cheesecloth will go a long way in keeping unwanted particles from entering your final product, and you’ll find plenty of other uses for it in the kitchen. And lastly, if any of these ingredients have you scratching your head, they’re all available online. 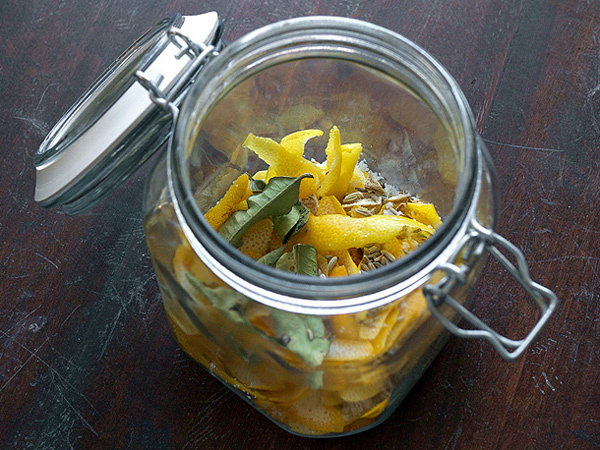 To make dried citrus, zest 4-6 large lemons (2 oranges or peel a 1″ nub of ginger and slice). Chop peel and lay on a baking sheet in an oven set at 250°F for 1 hour. Peel should be completely dry but not brittle. Dried lemon zest is also available commercially. After two weeks, strain out solids and set aside. Strain liquid through a cheesecloth to remove any particles left and transfer to an airtight container. Store in a cool, dark place. In a small sauce pan, combine solids with water and bring to a boil over medium high heat. Once boil is reached, turn heat to low and let simmer, covered, for 10 minutes. Remove from heat and let cool. Once cool, pour contents of the pan into a separate airtight container and let sit one week. After a week, strain out solids through a cheesecloth-lined fine mesh strainer. Add to the original liquid that has been set aside. Let sit at room temperature for 3 days and skim off any residue that accumulates at the top. Strain again if there is any leftover sediment and bottle into dropper bottles for storage. 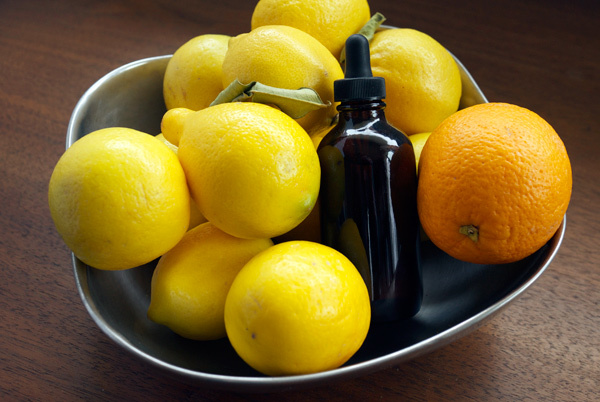 Meyer lemons have a more pronounced floral aroma, as opposed to just a regular lemon, which tends to be more astringent. 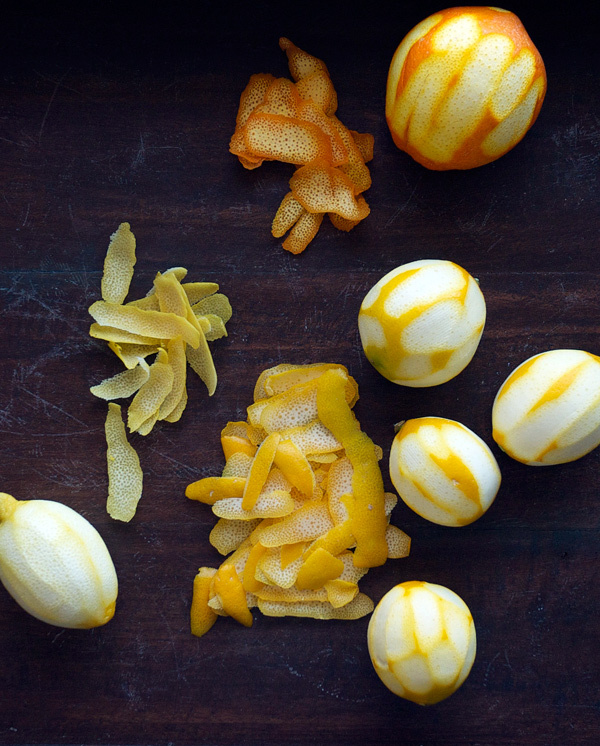 To pierce the perfumy nature of the meyer lemons, the kaffir lime leaves give a nice punch and aroma, while the bitter orange, fennel and spices create earthy undertones for balance. I add a few drops to a Gin & Tonic, and they can be used as a sub for recipes using regular lemon bitters. Experiment and see what cocktails work for you! *This recipe originally appeared on the Serious Drinks site.